What does this affiliation mean to Kinlin Grover Real Estate clients? When selling your home, you need global exposure in addition to the strong marketing expertise Kinlin Grover delivers locally and regionally. As an affiliate of Leading Real Estate Companies of the World®, we have the global resources to market your property to the highest possible number of potential buyers. With 130,000 talented associates around the world, we expose your property to buyers on six continents ensuring more eyes on your property. The result? 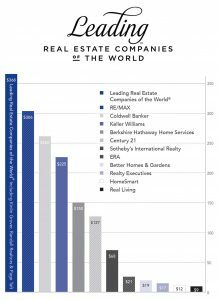 The LeadingRE organization produced more home sales volume in 2016 than any national franchise, $368 billion, and representing over 1.1 million transactions In addition, we receive inbound clients from other affiliates around the globe who are interested in purchasing a home. Kinlin Grover leverages LeadingRE’s world-class marketing, technology and resources, however, being part of the global economy goes far beyond technology; it requires the human touch. We are proud to belong to the global network whose name says it all – Leading Real Estate Companies of the World®. Only the best of the best are part of this collection. Wherever you go, the Leading Real Estate Companies of the World® logo is a symbol of the finest local real estate professionals. Actual member statistics for LeadingRE and estimates for other networks using average sales units per agent and average sales price for firms in each respective network from published sources for 2016 production. Sources: REAL Trends National Network 2016 Totals Final Report, REALTOR® Magazine 2015 Franchise Report, and various website research.